I've made a great friend or two (or a hundred) in the tutoring industry. One of them is Marna Marteeny of Kirkland Mastery Math. The other day during the Think Bright conference, she mentioned in the question and answer session that she gets a lot of students from Craigslist! I personally haven't had much success with it here in my community, but I was intrigued about her success. She shared her Craigslist posting with me and we looked at some of the “competitors” (if you can call them that). 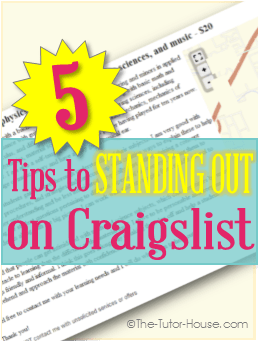 I asked her a few questions and together we created these 5 tips for helping you stand out on Craigslist. Let's begin with a competitors ad. Notice how there is no picture? Just a map? It also has a lot of text and no clearly defined list of what services the tutor offers. Also, this tutor is only charging $20…which can make it look really sketchy. Now compare it to Marna's ad. She has a picture of her working with children. 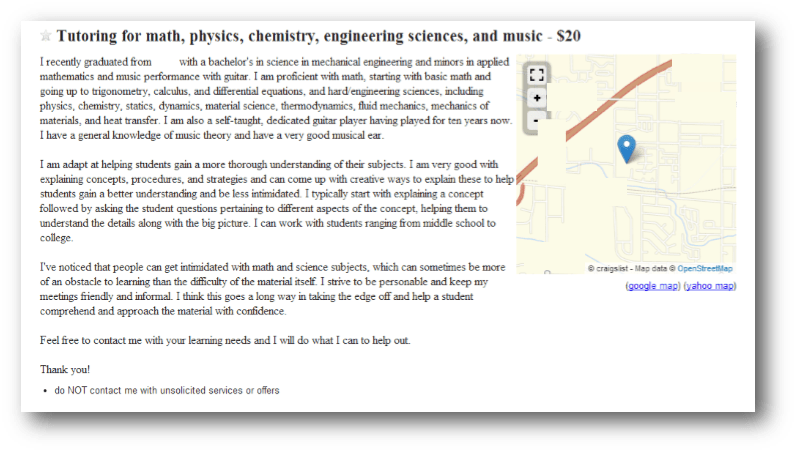 She clearly lists what math subjects she tutors and lists her website information. Adrianne: How many students have you gotten from Craigslist?Marna: 10 or so. Some are 2x/week students as well.Adrianne: What type of information do you think is most critical to include? Marna: How you can solve their problem. One big problem in our particular area is Discovering Geometry. I have gotten several students through advertising directly about that curriculum. Adrianne: How often do you repost your ad? 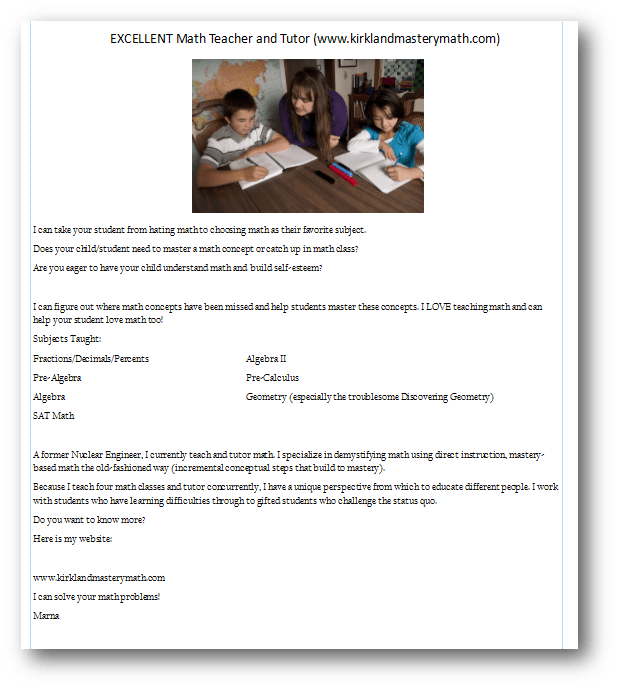 Marna: Weekly when I am looking for students. I think it helps if they see your ad more than once. Adrianne: Any other thoughts that you would like to share? Marna: Craigslist is great for building students. Usually parents are more technologically inclined if they found me through Craiglist. When I need more students, Craigslist is my go to place. If your ad stands out head and shoulders above the rest, you will get clients. Don't worry if you don't get any business your first week or two. The first time I ran an ad (I had one tutoring slot open), it took to the very end of two weeks to get even one call. But that one call ended up with a client that has used me on and off for three years. Currently, I am teaching her entire math curriculum, because their private school isn't teaching math at the level she needs. Even if it takes longer, don't worry. You want to build long-term clients anyway. My rates are on the high side for my area ($65, and the average is probably $50. Under $50/hour sounds desperate). I have found that I get more calls if I don't include my rate in my ad, but people need to come to my website to find out. By the time they have invested the time to read my website and about me more, they usually don't run away at the cost. 1. Include a picture or two! 2. Keep your text short. Too much text makes people skim and SKIP you all together. Make sure to do a brief intro, maybe include a tag line, and then use bullets to list your subject areas. When your ad is dated over a month old, parents will assume that you are full or done tutoring. Make sure to save your ad and then repost it about once a week. This is super important! At the bottom of your post, include keywords that may show up in a parent's' search for a tutor. I hate to even type this… but make sure to add the word “tudor” to your keyword list because quite honestly, a lot of parents do not know how to spell it correctly. Adding that one word may just help you show up in more searches. What about you? Have you had success with Craiglist or Kiji (Canadian)? Tell me in the comments. Checking the text for spelling errors is a must. Notice in the first ad, the lister claims to be “adapt at tutoring” rather than adept. Thanks for all the great feedback and help for all us tutors out there Marna!